If you live in a manufactured home, chances are you may have a disproportionately higher energy bill than a family living in a modular or traditional wood-frame home. 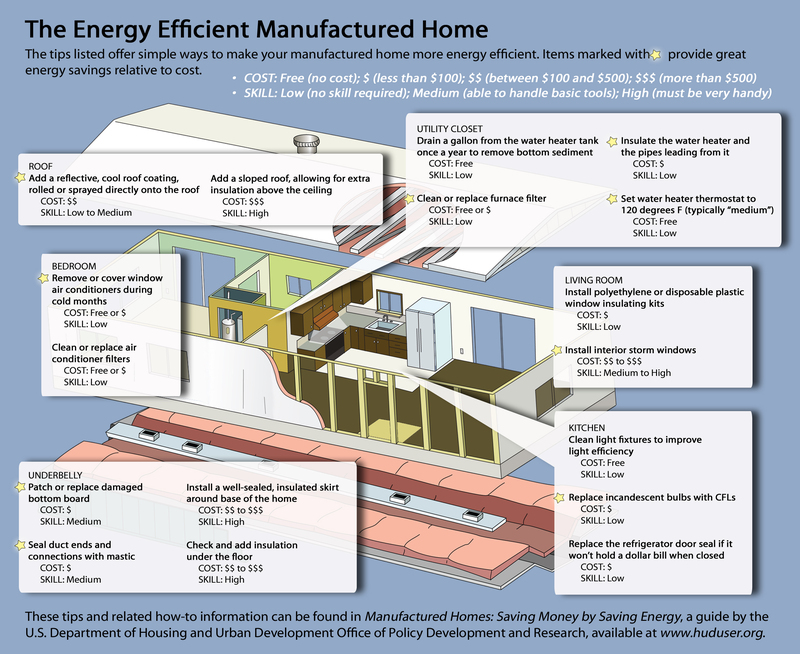 The good news is there are many ways you can improve your home’s energy efficiency. Manufactured home or mobile home? First, a clarification. Some use the term manufactured home and mobile home interchangeably. A mobile home is a factory built home constructed before 1976 when the U.S. Department of Housing and Urban Development (HUD) set national standards that nearly every manufactured home must meet. Thereafter, factory-built homes were called manufactured homes and are engineered and constructed in accordance with the 1976 federal code administered by HUD. Manufactured homes come in all shapes and sizes. They may be single- or multi-sectioned and are available in various sizes and floor plan configurations. There are many differences between manufactured homes built before the U.S. HUD Code took effect in 1976 and those built afterward. One of the major differences is energy efficiency. Those built before federal standards were put in place were generally not as energy efficient as later models, even though thermal standards were changed in 1994. And while your manufactured home may have been built to the energy standards of the time, significant progress has been made over the past decades with high-efficiency mechanical equipment, windows, insulation, siding and roofing materials. In short, whether your home is less than five years old or more than 50, most homes can benefit from energy efficiency measures simply due to wear and tear. Sunlight, seasonal temperature changes and wind can increase air leakage. Doors and windows may not close tightly and duct work can spring leaks, wasting cooling and heating energy. Add insulation to your roof or install a roof cap. In addition to the measures listed above, consider caulking and weather-stripping windows and doors, particularly if you are not able to replace them with more energy-efficient ones. Properly seal any openings around ducts and plumbing fixtures. Replace any incandescent light bulbs with LEDs – both indoors and outside. Reduce “phantom” loads by unplugging electronic devices such as computers, printers and gaming systems when not in use. If you are planning to move to a new manufactured home, look for the Energy Star rated model.